For a long time, I kept saying the gold’s rally is over for the mid term. It looks now the QE2.0′s effect is dragging dollar, now with rising soft commodity prices and oil price. The combination of the popular uprising from North Africa to Middle East and dilution of USD seem to push the money into stuff like oil, gold and silver. The commodity prices often experience climax spike towards the end of the bull market, and the current price action on oil, gold, and silver may not be the exception. 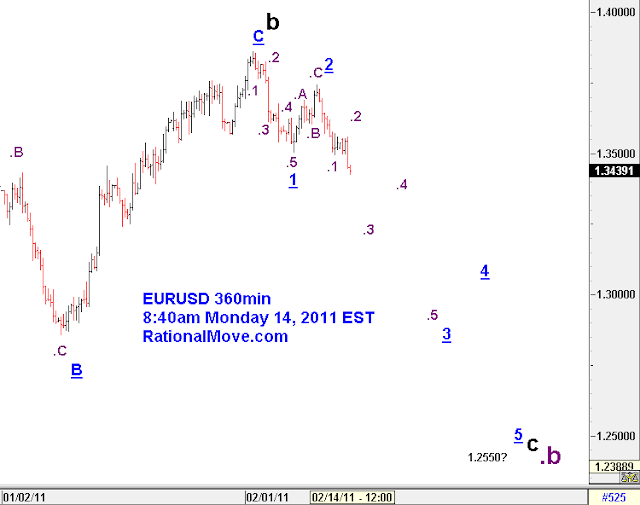 Along with this possible scenario, I updated my Elliott wave count as follows. The 1st chart is weekly. The second is the daily chart. I can count the current uptrend as an impulse wave towards .1. 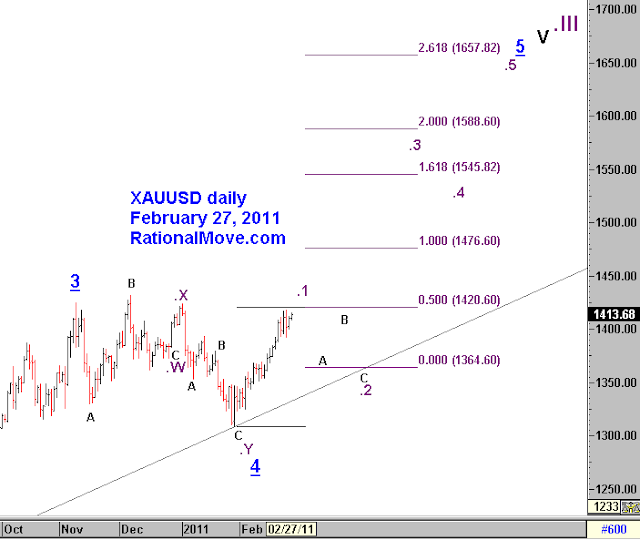 If I see a zigzag wave down coming close to 1364. next, I will get ready to buy gold. I’m not sure how high the gold will spike, but going over$1650 may be possible. As EURUSD comes close to my stop loss line 1.3750, I do not hide the fact I don’t enjoy when my position is being threatened. I’m uncomfortable, but I’m not scared because my betting size is well managed. If I was scared now, that would mean my position was too big. If the position is too big, I get scared, and I would not be able to operate on the set rules. 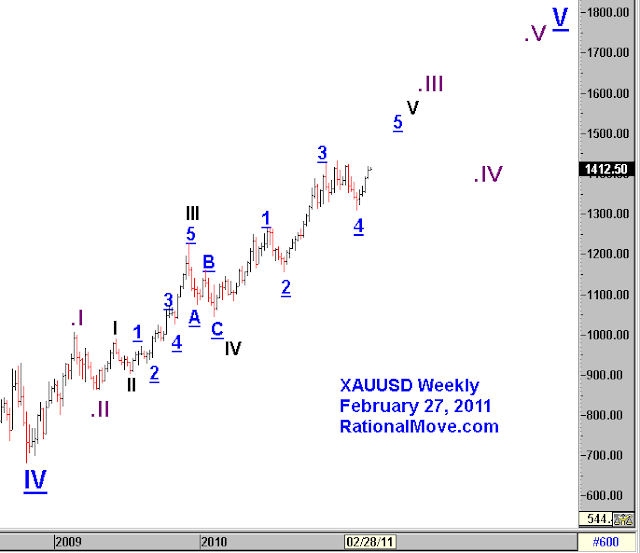 Wave .2, though it is coming really close, but does not have the characteristics of an upward impulse wave. 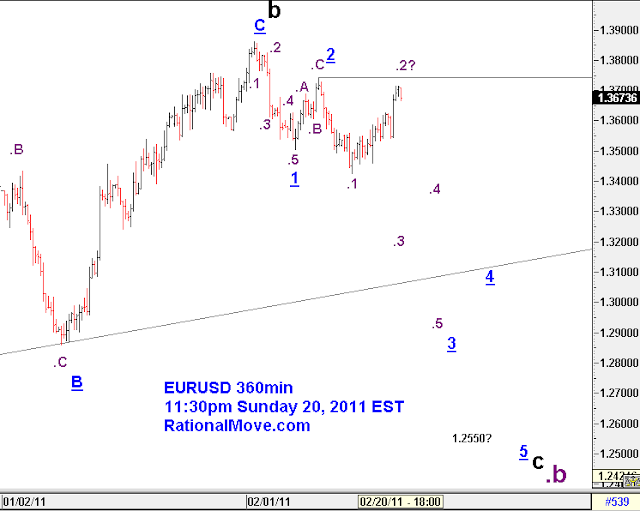 So, I will keep my current assumption that EURUSD is in Wave .2, and it will follow a big drop without going higher than 2. No body can beat the market, and I could be dead wrong here as in the every bet I put. If I am to be proven wrong, I would just move on and re-analyze the market, and place another bet when the right time comes. The last thing I would do is to break the rules of keeping and throwing the position. That all said, I’m optimistic. Six days since I entered the EURUSD short position, and it’s looking good so far. EURUSD clearly marked 2 at 1.3744, and went below 1, so I sold some more at 1.3495. Now my average entry is 1.3518. I moved stop loss for all position to 1.3750.